Did you notice stores selling Christmas ornaments as soon as Labor Day weekend was over? Seems like every year the holidays start creeping up sooner and sooner. It used to be that October 1st you saw stores putting up their Halloween Decorations, November 1st changed to Thanksgiving and the Friday after Thanksgiving everywhere turned into a winter wonderland. Retailers gave you the courtesy to enjoy one holiday at a time. But now we start worrying about Christmas in September, which clouds the festivities in between with panic. This panic in turn makes the holidays fly-by in a blur which we barely manage to recover from. Black Friday is the culmination of that panic. Every year you see news stories about customers camping out in the wee hours to be the first ones in the big box store to get the best deal. In the worst case scenarios you hear about actual stampedes and even acts of violence happening in major retail stores. Retailers took note and started opening at 4 and 5 am, some even open at midnight so you can squeeze in a nice after turkey nap before you go. At some point enough people decided to avoid possible bodily harm and check for deals online. From this was born Cyber Monday. 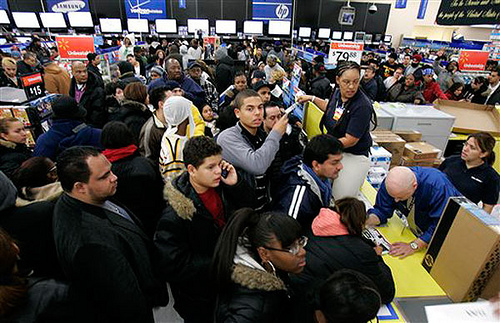 The term was coined in 2005, after researchers noticed that the Monday after Thanksgiving Day 2004 was one of the largest online shopping days that year. Since then, more and more consumers have taken to making their purchases online by taking advantage of special Cyber Monday exclusive deals. Accessory Genie will be offering some Cyber Monday electronics deals of their own, including free standard shipping, so make sure to check back. Wear comfortable shoes for the 3 hour wait in line at the register. Better yet, wear some steel-toe boots to prevent injuries from errant shopping cart wheels. Layer. The temperatures are dipping and the hours of midnight through 5 a.m are especially chilly so dress warm but remember that once inside that big box store temperatures will soar as a result of so many frantic shoppers darting about. Make sure to stay hydrated. Drink plenty of water, especially if you spent the morning drinking hot coffee to stay warm. But be prepared for Disneyland-like lines at the bathrooms. Map out your shopping territory based on the multitude of flyers you have received in the mail so you can run straight for that 60" flat screen. Bring a buddy so they can run ahead to get the items you want, because by the time you get through the shopping cart traffic jam they'll likely be out of stock. Bookmark your favorite deal sites or store pages for quick access to product offers. If you're getting several email newsletters, save your favorite ones in an email folder so you can easily go back to them. But proceed with caution. According to studies, since Cyber Monday, 2011, about 22% of employers had to fire an employee due to non-work related internet use.